When you are outside in St. Peter's Square (Petersplatz), take a little time to walk around the church and admire the harmonious and dynamic lines of the building. Note the relief by R. Weyr depicting the supposed founding of St. Peter's Church of the Middle Ages by Charlemagne. Admire the well proportioned apse (15) with the statues of St. Michael and St. Peter (by Mattielli), and the front portal decorated with figures of lead, by A. Altomonte. Note the inscription commemorating Emperor Leopold's vow to build this church at the time of the plague of Vienna in 1679/80. St. Peter's is indebted to M. Steinl for the interior decoration (including the pews), but also for the warm religious atmosphere radiating from these works and inviting one to prayer. The reliquary shrines – beneath the two side-altars at the front with their representations of the Holy Family (by A. Altomonte) (10) and St. Michael (by J. G. Schmidt) (11) - are likely to draw your attention. The shrines contain the bones of two martyrs, brought from the Roman catacombs in 1733 by Cardinal S. Kollonitz. They were clothed in the style of the period and placed in these reliquaries. Under the picture of the Holy Family you can see an image of St. Josemaría Escrivá (by M. Fuchs), the founder of the Opus Dei personal prelature. He was canonized by Pope John Paul II in 2002. Take another look up at the cupola: you can see the imperial coat of arms with the motto of Leopold I over the triumphal arch (6). 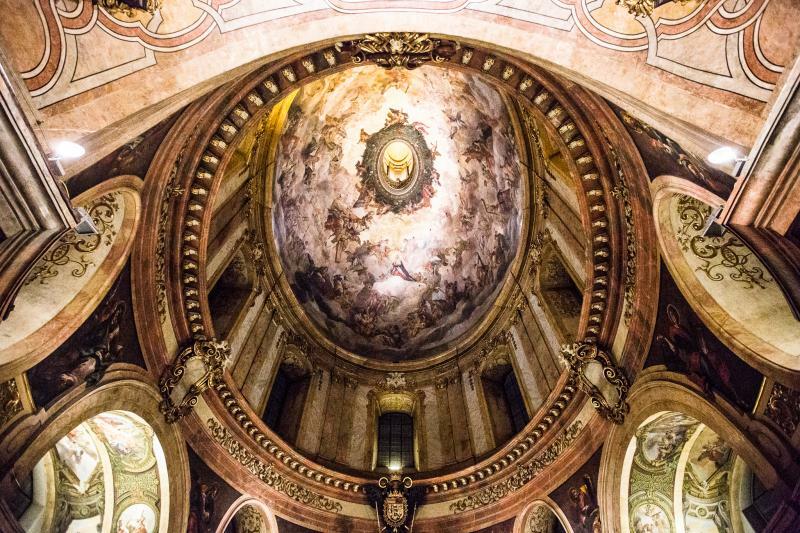 On either side you can see the richly decorated oval windows, flanked by the carefully executed portraits of the four Evangelists and four Latin Fathers of the Church, which were painted by the Viennese artist J. G. Schmidt. 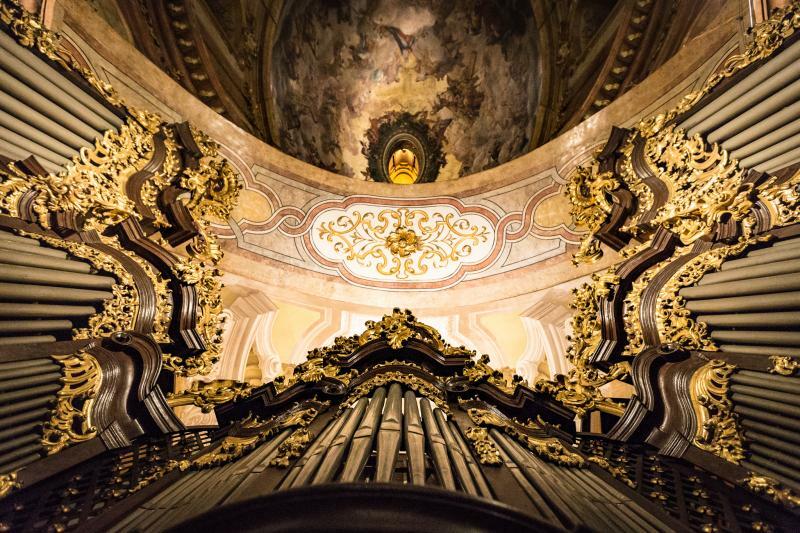 At the back of the church you can see one of the most beautiful Baroque organs in Austria. 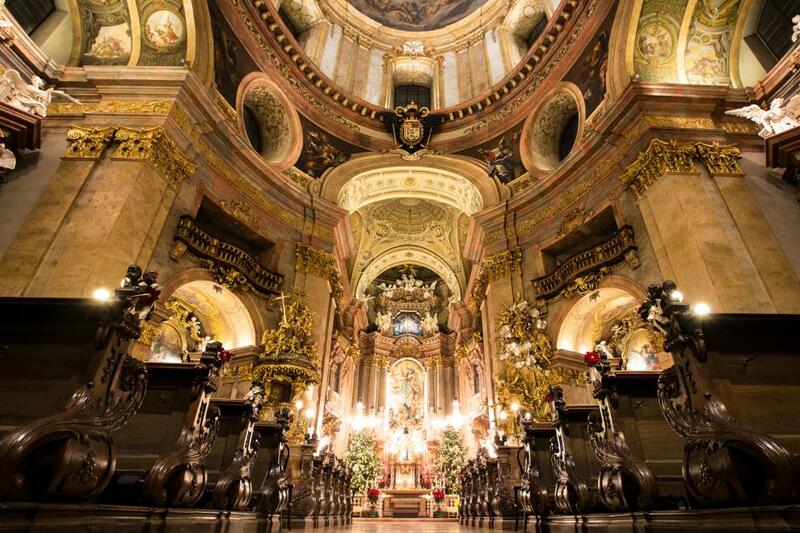 Welcome to the Saint Peters Church, one of the most beautiful barroque churches in Vienna, built from the year 1701 to 1733 based on the plans of Lukas von Hildebrand. 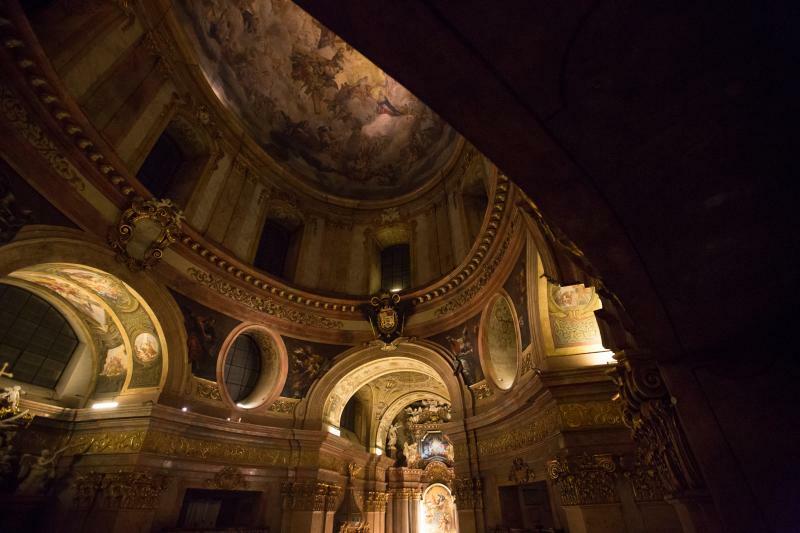 It was here back in the 4th century and under the roman empire where the first church was built in Vindobona, now Vienna. Since then. this worship is celebrated here. 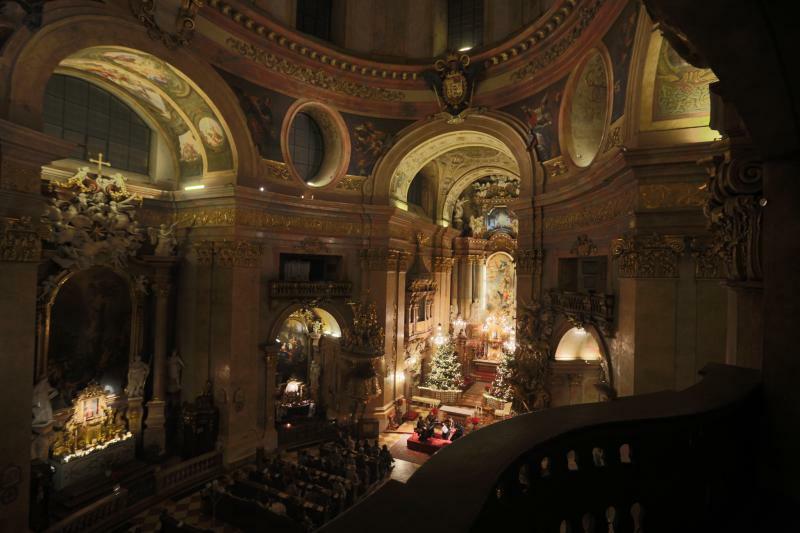 Liturgy, masses and music makes Peter's Church a hot spot for the locals and tourists. Also the Classic Ensemble Vienna has found his home here. 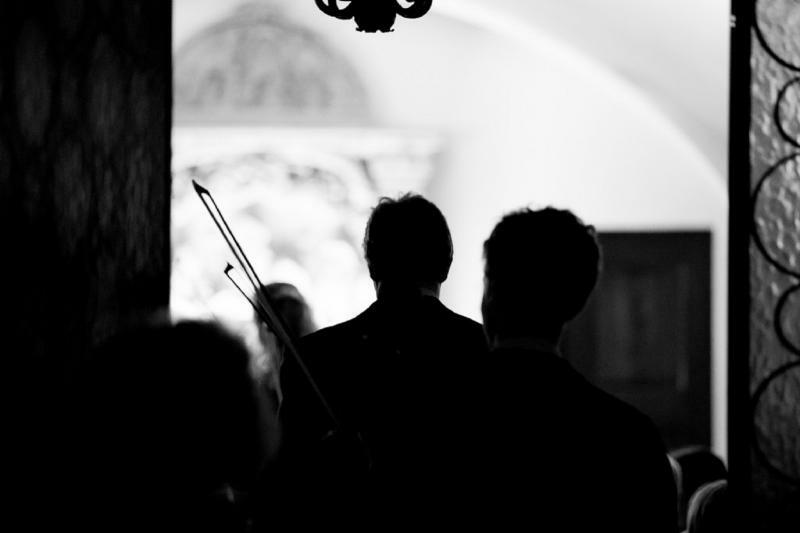 Consisting of internationally renowned musicians who had many successful performances in Austria, Mexico, USA, Sweden, Germany, etc., the Classic Ensemble Vienna captivates with beautiful interpretations of Mozart, Beethoven, Bach, Vivaldi and more. We invite you to experience this unforgettable journey. The Peterskirche is located on Petersplatz, right next to Graben and just west of the Pestsäule. 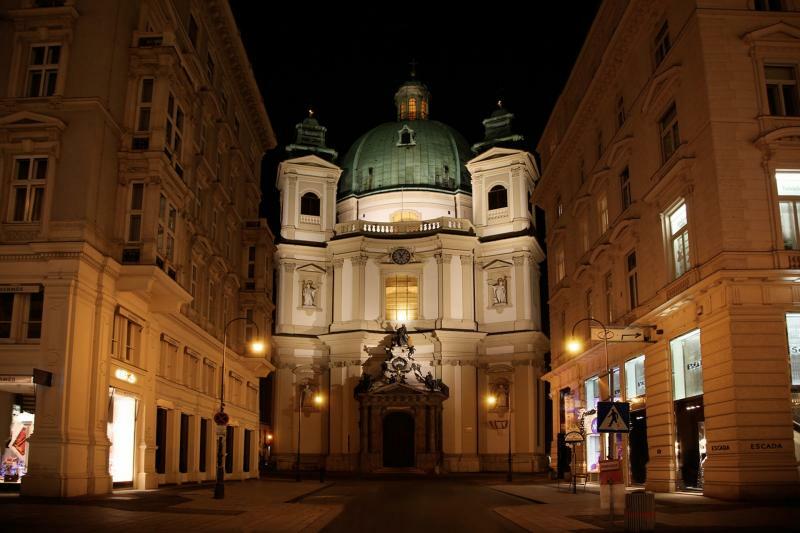 The street Jungferngasse cuts through the pedestrian zone and leads directly to the church. The Peterskirche is largely obscured by the surrounding buildings, and can only be seen clearly from directly in front.